When Porsche needs to test the new 2013 911 Carrera 4S they take it to the Porsche Experience Centre at Silverstone. It’s a place where drivers can test the limits of the latest new sports car from Porsche. The all-new 911 Carrera 4 and 4S with all-wheel-drive are designed for extreme track conditions and need to be driven at a track like Silverstone in wet and dry conditions to truly experience the sports car. The Porsche Driving Experience Center opened its doors in November 2008 after six years of development and is located in the heart of England. It is situated at Silverstone Circuit, the home of British motorsport, located next to Hangar Straight, on the site of the WRC Rally of Great Britain special stage used in the late 1990’s. It’s the perfect environment to test the limits of the performance sports car. With Porsche, vehicle development is relentless and ongoing. In the past decade, huge technical and mechanical advances have produced today’s highly capable sports cars. The 2013 911 Carrera 4S is the latest example of the advances in technology and how it translates to extreme performance. The new seventh-generation 911 Carrera 4 models coming with Porsche’s latest version of the active all-wheel-drive system, Porsche Traction Management (PTM). The advances feature cars that are lighter, more fuel-efficient and offer new technology. Porsche has reduced weight in the new 911 Carrera 4 by up to 143 pounds with an increase in fuel mileage as much as 16 percent. 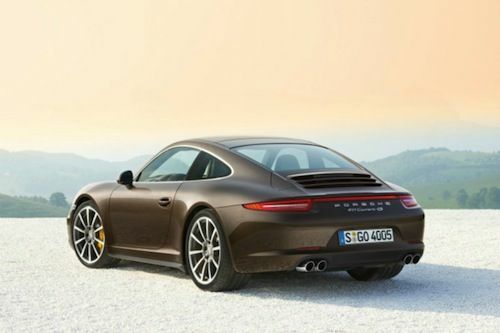 The all-new 2013 Carrera 4 models with all-wheel-drive will feature a wider rear section than the standard model. The rear wheel housings extend out further by 22 mm, with 10 mm wider rear tires for improved traction on wet or dry pavement. In the video below, drivers were able to take the new sports cars and test the new system in wet conditions. New for 2013, the all-wheel-drive models feature a menu in the instrument cluster that will inform the driver how the PTM all-wheel drive is currently distributing engine power. On the track, the driver can see just where power from the Carrera 4S 3.8-liter boxer engine is being distributed to the four wheels. The 911 Carrera 4 S 3.8-liter boxer engine produces 400 horsepower, and Porsche says the new sports car will launch from 0-60 in 3.9 seconds (Cabriolet: 4.1 seconds) with a top speed of 185 mph (Cabriolet: 183 mph). The engine comes mated to a seven-speed manual gearbox as standard, and the Porsche Doppelkupplung (PDK) seven-speed gearbox is optional. In Porsche’s latest 911 Carrera 4 clip, they feature track footage and interviews from the Porsche Experience Centre at Silverstone. Watch the video below as it captures people's reactions and thoughts about the new model. It takes time for even an experienced driver to enjoy the 2013 Porsche 911 Carrera 4S to the full.